Continuing to celebrate their 150th Birthday, Bacardi‘s consumer brand awareness and promotions appear to have plenty of fans and even the more avaricious among us have noticed the potential to make a quick-buck out of those looking to party with the Bat. 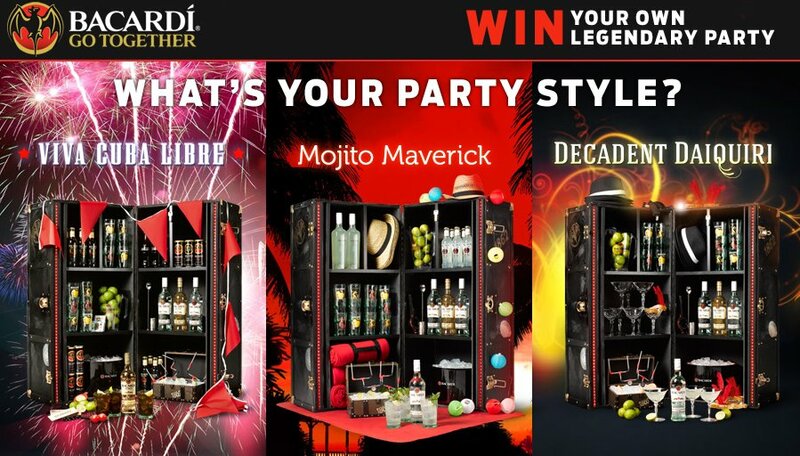 Among this years promotions is their latest competition to ‘Win Your own Legendary Party‘ and up for grabs are a total of 50 Bacardi Party Trunk’s, each one based on one of three cocktail themes (17 Cuba Libre Trunks, 17 Mojito Trunks and 16 Daiquiri Trunks). Valued at £3,000 each, the Trunk’s come complete with several bottles of Bacardi, glasses, cocktail paraphernalia, clothing and even includes a Bacardi representative to help set up the the Trunk in preparation for the winners party. Many of the items are limited edition and won’t be available to buy. With the tagline of ‘We’ve been throwing parties for 150 years, now you can win one’, the competition is open to residents in the UK and ROI and simply requires you to select your ‘Party Style’, over 5 questions. Each question has 3 choices and there isn’t a wrong answer. After you have answered your last question, you will be presented with what Bacardi believe is your ideal party Trunk and be asked to submit your details to enter. Nothing could be more simple, so for more information and the chance to enter head to party.bacardi.com before the 15th August 2012. With the competition having already started on Monday 28th May 2012 , with a couple of draws having already taken place, a few lucky people have already got their hands on their prizes and should have everything needed for a great night. Of course there’s always someone more interested in trying to make some money of off something like this and one winner in the North East of England has already decided to cash in on the popularity of Bacardi by listing their prize on an ebay auction, that saw the seller making £920 after 32 bids. Now I can’t deny I was keeping an eye on this, having first seen it listed at £30. Of course picking the Trunk up for anything less that £150 would have been considered the bargain of the year, but when it jumped from £130 to £920 a day or so before the auction finished, all I do was watch and see. 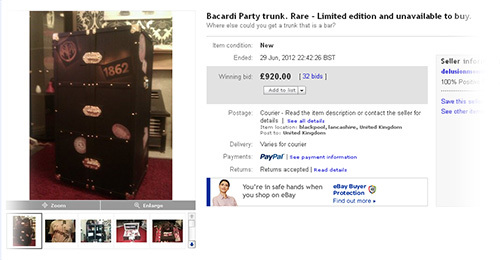 Of course had that been me who had won one of the Trunk’s I wouldn’t have put it on ebay. I’d have used it as intended and invited lots of friends to share in my good fortune. Of course, running a Rum Blog and winning a rum based party package, I’m going to say that, so I can’t be too harsh in what I think about someone making money out of such a prize, even if part of me thinks it’s not right. Of course this kind of thing isn’t exclusive to prize winners as there are other recent examples of people trying to cash in on limited edition Bacardi’s products and the brand’s popularity. These currently include the Buy it now price of £95 + delivery for a set of all 4 of the Bacardi 150 Years Limited Edition bottles in red, grey, gold and blue, despite some of them probably still appearing on supermarket shelves. However, these bottles do at least contain their original content, which is more than can be said of the same set of four, but of empty bottles, with a starting bid of £19.99 + delivery. Talking of Bacardi promotions, for those of you who have taken a liking to Bacardi Oakheart Spiced Rum, keep an eye out for special bottles in the UK with an offer to send away for Bacardi Oakheart Stein glasses. So good luck to everyone who has entered the Bacardi Party Trunk competition and remember to keep an eye on Bacardi’s Facebook page for more promotions and competitions.